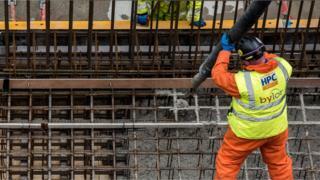 The first concrete has been poured in the construction of Britain's first new nuclear power plant in more than 20 years. Work has now begun on Hinkley Point C in Somerset, including the building of tunnels to carry cabling and pipes. About 1,600 workers are now onsite to work on the £18bn project, which is due to begin producing power in 2025. Pouring the concrete was a "significant milestone", project director Philippe Bordarier said. Other progress announced by EDF Energy, which is behind the scheme, includes beginning work on a 500m (1,600 ft) temporary jetty in the Bristol Channel. A store is also being built to contain 57,000 tones of aggregate, which can be brought in by sea rather than by road. Work to build the first of 50 huge tower cranes at the site along with accommodation for workers has also started. Mr Bordarier said: "Pouring the concrete for the first permanent structure [at Hinkley Point] is a significant milestone. "It is the outcome of many years of preparation and hard work from all our teams and supply chain across the UK and France. "It demonstrates our ability to undertake the serious responsibility of nuclear power plant construction." EDF said the plant will provide 25,000 job opportunities and 1,000 apprenticeships, with over 5,600 people working on the site during core construction. It is hoped Hinkley Point C will provide up to 7% of the UK's power.